As we begin our national conversation about tax reform, why don’t we start with low-hanging fruit – the things we can all agree are right? Why not reinstate the Superfund tax, which used to make polluters pay to clean up their own mess? By reinstating this “Polluter Pays” tax, American citizens will save literally billions of dollars. There is no need for a new law, big debates or much else. All Congress needs to do is simply reinstate this law, which lapsed at the end of 1995. Everything is already in place, and it’s proven to be an effective way to clean up toxic wastes as well as protect public health and the environment. I am sometimes called the “Mother of Superfund,” as I led the successful effort to relocate over 800 families, including my own, away from the Love Canal toxic waste dump where we lived in Niagara Falls, NY. We all celebrated in 1980 when President Carter signed the bill to create the Superfund, which forced polluters to take responsibility for their actions. Then in 1981, President Reagan named Anne Gorsuch to head the Environmental Protection Agency. She quickly moved to dismantle the Superfund law, leaving behind a crippled program. Now the Trump administration is looking to finish the job that the mother of our newest Supreme Court Justice failed to do decades ago. When the “Polluter Pays” tax expired in 1995, American taxpayers were forced to take on the burden of cleaning up the worst toxic waste sites in the country. These costs have risen to more than $18 billion since then. 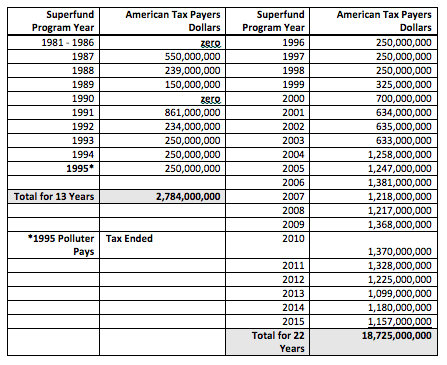 During the first thirteen years of Superfund, before the tax sunset, American taxpayers only contributed about $2.8 billion. These fees have been used to clean up the worst toxic waste sites that are abandoned, were created by a company that went out of business, or where the responsible corporation refuses to take responsibility and legal action is needed. The balance of these funds have come out of the government’s general revenue, or in other words, directly from taxpayers’ pockets. That’s a lot of money that by all rights the corporations that create and use toxic chemicals should be paying, not us. Clearly, American taxpayers shouldn’t have to foot this bill. The tax is simple: if a corporation makes two million dollars in taxable income, then all profits after that are taxed at the rate of 0.12 percent. Now I’m sure Exxon-Mobil or Dow Chemical can afford this tax. If they make $10,000 beyond the $2 million threshold, their tax will be equivalent to the cost of a cheese pizza. If their profits are less than two million, they aren’t required to pay a penny. It’s that simple. Corporations in the manufacturing industrial sector (e.g. chemical and allied products, petroleum and coal products, electrical and electronic equipment) and mining sectors historically paid about 41 percent of this tax. These sectors are responsible for about 43 percent of all Superfund sites. Taxpayers now pay for all Superfund-led toxic cleanups, spending well over $1 billion annually to protect public health from the irresponsible business practices of polluting industries. As valuable public dollars are spent on these cleanups, polluting industries are enjoying a $4 million per day tax break courtesy of the American taxpayer. More than 53 million Americans still live within four miles of a Superfund toxic waste site. 18 percent are children and 15 percent live below the poverty level. These toxic sites expose innocent families to dangerous toxic chemicals every day. The cost to families living around these sites is much more than the price of a pizza. Health costs, the loss of a loved one, missed days at work, devalued property, and loss of the ability to enjoy their homes and communities. The Crude Oil Tax portion of the program originally put a 9.7 cent-per-barrel tax on the purchase of crude oil by refineries and other industries. But Congress later eliminated most Superfund liability for oil spills. This means Exxon-Mobil is only expected to support the “pizza” level tax. The oil industry is one of the most polluting industries on the planet. Each year, at least 14,000 oil spills occur in America. Lastly, there is the Chemical Feedstock Tax on the most dangerous chemicals. Corporations could avoid this tax entirely by using safer chemicals in their products. This assessed a fee on the purchase of any of 42 toxic chemicals associated with dangerous substances at Superfund sites. The amount of this tax ranged from $0.22 to $4.87 per ton, except on xylene, which was taxed at $10.13 per ton. The tax also exempted certain chemicals when used for certain purposes (e.g. methane and butane when used for fuel) or when produced in certain ways (e.g. any listed chemicals derived from coal). Superfund sites are created when a state is unable to handle the cleanup of a dangerous site due to lack of staff, expertise or resources, and asks for help from the federal government. For this reason, Superfund sites cannot be sent back to the states. Even so, states don’t get a free ride, as they have a responsibility to pay a percentage of the costs. State and cities across America want these toxic sites cleaned up so they can be redeveloped and no longer have a Superfund site blighting their community. The Trump Administration, which says it wants to develop our nation’s resources, should be all for the ability to redevelop these sites, which is generally done through the Brownfields program. However, without the “Polluter Pays” tax, even Trump can’t develop these properties, because too few of them are being cleaned up. The number of completed cleanups decreased from 80 sites annually in 1999 and 2000 to 13 by 2013. Reinstating the “Polluter Pays” Tax should be the first step in any tax reform. It’s the right thing to do.